Today’s still presents us with one of a surprising perspective. Looking out over the semi-deserted street, bombed out buildings and—as Matt discussed in detail last week—the Cafe Marc Aurel, where Holly lies waiting at the center of a spider’s web, we are looking out from Harry’s point of view. The previous shot situated Harry reaching the top of a mound of crumbled marble, right behind this slightly ironic figure of blind justice in the rubble. Curiously enough, or perhaps out of general dimensional ignorance, Calloway’s team of policemen, sent in to “trap” Harry have completely neglected the mountains of rubble surrounding their locale. In typical police fashion (at least from an understanding set forward by Hollywood heist movies) the cops have imagined roads as the only way to approach this spot, and Harry is too smart for their game. Harry traverses Vienna, it seems, mainly through abandoned ruins and complex sewer tunnels avoiding the roads completely, and his chosen mode brings him to this beautiful vantage point. This frame is a part of one of the most beautiful shots of this entire film. After a quick medium close-up of Harry in his full cigar-smoking lotharian glory, he looks off camera right and we cut into this POV shot. A slow, pan starts at the fountain, where Calloway and Payne are currently hiding, along with their single balloon. It continues across a swath of wartime destruction—literally, city blocks of nothing but flattened buildings—and passes to today’s moment, skirting the object of this gaze, the Cafe Marc Aurel, where Holly waits for Harry. The shot continues from this point, lingering a moment and then starting a slow track forward, above the railing and into space toward the cafe. The POV shot certainly emphasizes the psychological implications of the camera’s movement. The pan seems self-evidently to connote a turning of the head, the zoom or the focus-pull a change of interest—a literal telephotification of the ocular lobe—but the track, especially one as seamless as this, brings a sense of actual movement. This is not a hand-held shot, though, so the movement through space seems infinitely graceful, almost ghostlike as the camera glides toward its destination. Harry will next appear to us coming in the back door of the cafe, seeming to have crossed the police-guarded street by some invisible mode. Perhaps he truly is one of the phantoms occupying this city of ghosts, and this track is the beginning of his gentle departure from gravity’s bounds. But back to our frame today, one can almost see the shape of the out-of-focus figure conspicuously drinking coffee in the window, gesticulating wildly. In the time since our last post, Anna has walked right in, through the police barricade, and come to try to talk Holly out of narc-ing on his friend and her lover. Spitting with venom, Anna has found out about this sting from Kurtz and the gang, all of whom have been arrested this morning. In one of her most mean spirited attacks, Anna let’s out something we’ve all been thinking: “Honest, sensible, sober, harmless Holly Martins . . . Holly, what a silly name . . .” Then, while Anna is haranguing Holly on how Harry will never be fool enough to come into a police trap, Harry walks in the back door. In a moment of character reversal, Holly is suddenly the cruel bad friend while Harry is the naive fool. Holly, going back on his earlier devotion to his old friend, has set up a huge sting operation to help catch him. Meanwhile Harry, even with the knowledge that all of his co-conspirators had been arrested, decided to come and meet Holly in this suspiciously trappable zone. Whether blinded by his friendship to the dangers that he might encounter, or simply willing to risk those dangers for the sake of the friendship, Harry shows in this moment a selflessness that has been absent from his character all along. And meanwhile, honest, sensible, sober and harmless, Holly has set a trap that will ruin Harry’s chances at freedom. Anna’s statements, at how Harry would never be fool enough to make this meeting, only go to intensify the extreme guilt that Holly must be feeling. 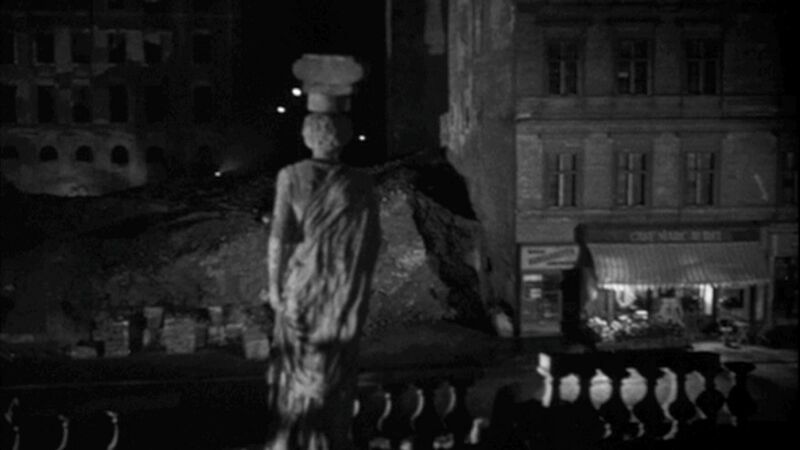 In this way, The Third Man, shot on location in Vienna, is almost documentary in nature, it’s intent to show the scars and pockmarks that plague Vienna’s post-war streets. While certainly different, Peter Watkins’ 1965 film The War Game shares many of these characteristics. The War Game was produced for television and (though never screened in Britain due to its graphic and terrifying images) imitates the conventions of documentary to create an image of England after a nuclear attack. Like this understanding of The Third Man, The War Game puts forward a strong anti-war message and leaves an understanding of the horrors of war, particularly those wars waged in cities and impacting thousands. Both films, The War Game and The Third Man carry within them a terror of living in a world in which such things are possible, particularly after the US bombing of Hiroshima and Nagasaki.